The latest blockbuster to come out of Hollywood called ‘Me Before You’ is seen as a gross misrepresentation of the lived experience of most disabled people. The film is based on the best-selling novel of the same name. A young man becomes disabled, he falls in love with his ‘carer’ and they have a fantastic year together but despite her protests, he decides to end his life at Dignitas so she can move on and he is no longer a burden to her. 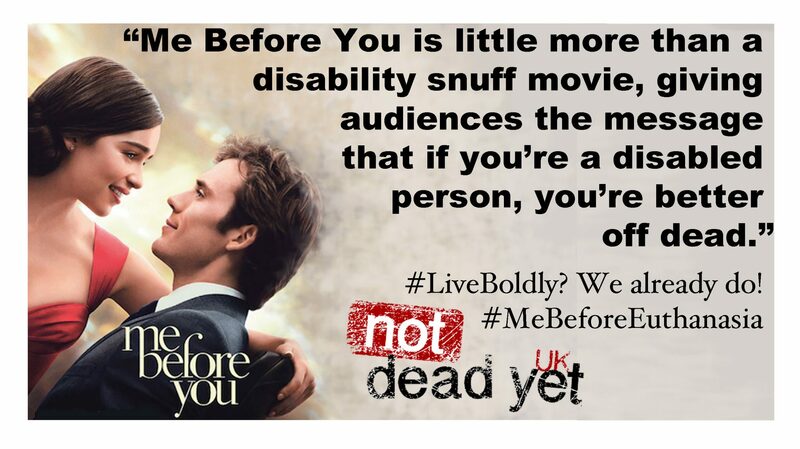 Not Dead Yet UK, and DPAC are deeply concerned to see yet another film which casts non-disabled people as disabled people and shows the lives of disabled people as not worth living.